We get a fortnightly organic veg box from Riverford to supplement the vegetables we grow, but it was only recently I became aware that there is also such a thing as a Riverford recipe box. How intriguing. As well as getting to try one of the boxes, I also have one to offer my readers as a giveaway. I’ve heard of the recipe box concept, of course and have even tried one, but the Riverford scheme is slightly different. It’s organic for a start and most of the items are sourced from its own farms and shop, making it an in-house production. I love the idea of cooking things in ways I might not otherwise have thought of; this also helps give me inspiration for future dishes. I suspect I might never have thought to make a curry out of celeriac, but I was given the ingredients and recipe for celeriac curry with chard & cardamom rice, so I went for it. And guess what, it was delicious. As it turned out, we didn’t get chard, but pak choi instead, the joy and challenge of seasonal provisioning. The rice was brown basmati which is probably my favourite, being nutty and slightly chewy. The meal was the only vegan one of the three. It was brightly coloured, warming and filling, just what we needed on a cold winter’s night. When I say there is a Riverford recipe box, I actually mean boxes. You can choose from the original recipe box, a quick recipe box or a vegetarian one. We received a vegetarian box for two. Ostensibly this provided three meals, but we actually got five out of it. Erring on the side of generosity certainly meets with our approval. We were provided with measured quantities of all the ingredients required, except for salt, pepper and oil. The vegetables and salad were all fresh and guidelines on keeping times were given. Each month / week the recipes are created by different chefs. Ours came from by Bob Andrew, former Head Chef at Riverford’s Field Kitchen. The recipe cards are thorough, well written and well produced. They even have a bit of farm news from Guy Watson, Riverford’s founder and organic pioneer. Roast veg souvlaki with chopped salad, yoghurt & pitta was perhaps my favourite of all, but then I do have a predilection for Mediterranean and Middle Eastern food. This was a veritable feast, both for the eye and the palate. It was a hands on event as we stuffed our warmed pitta breads with the chilli and oregano roasted veg and halloumi. We were both mightily impressed with the fennel, tomato and olive salad, which we elected to serve separately from the salad greens. Spooning on the delicious garlic yogurt sauce completed the experience. This is the kind of meal to share with friends. It was an utter delight not to have to think what to cook and to have a varied range of delicious and organic dishes to eat during the week. The portions were on the generous side, which was fine by us as we were able to get two meals out of the curry and two out of the slow cooked shallot trenne with mushrooms & rosemary. The slow cooked shallot sauce gave an individual character to a classic Italian fast food. With plenty of mushrooms included, it was a case of Umami Mia. A Riverford recipe box for two costs £33.95 and provides at least three meals. Boxes for four people are also available. For more information on Riverford, hop over to the post about my farm visit. I was sent a Riverford recipe box for review purposes. I was not required to write a positive review and all opinions are, as always, my own. Riverford is kindly offering one lucky Tin and Thyme reader a vegetarian recipe box for two. The recipe and ingredients are likely to be different to the ones I received. To be in with a chance of winning, please fill in the Gleam widget below. You will need to leave a comment on this post, answering the question, which then gives you additional chances to enter if you so wish. Gleam will pick a winner at random from the entries received. If you are commenting anonymously, please give me some way of identifying you as I will be verifying the validity of entries. Any automated entries will be disqualified. This giveaway is only open to those in England and South wales who live within a Riverford delivery area. Winners will need to respond within 5 days of being contacted. Failure to do this may result in another winner being picked. Please note: Although Riverford deliver to most locations in England and South Wales, they don’t deliver everywhere, so you might want to check they deliver to you before entering the giveaway to avoid any disappointment. There is no cash alternative. Prizes are offered and provided by Riverford and Tin and Thyme accepts no responsibility for the acts or defaults of said third party. Tin and Thyme reserves the right to cancel or amend the giveaway and these terms and conditions without notice. Do take a look at the giveaways page to see if there’s anything else you’d like to enter. I’d love to see some asparagus and I’d love to make a creamy chicken and asparagus risotto! I’d love this to expand my veggie recipe practice! Ooh that’s a nice idea Sharon, though the recipe box is for main meals rather than pudding. I didn’t realise Riverford did recipe boxes either but it sounds like the meals you made out of it were delicious and it’s always good to be pushed to try something you wouldn’t have done otherwise like the celeriac curry. Exactly Corina. Loved all the recipes and it’s such a good way to try new recipes. i would like to see sweet potatoes and i would make wedges. Its been a long while since I delved into a Veg Box and this would be a delight, esp. with recipes to try! Well it’s not quite a veg box Shaheen as it has all the ingredients needed to make the recipes, but it does, of course, contain veg too. Was fab. Chard – a stir fry of sorts. Asparagus, because I love it. I would cook it lightly and serve it with some melted butter as part of a meal. Have I lost the plot? I thought St Piren’s Day had already gone. I love these boxes – takes all the thinking away about what to have for dinner that night. And they’re so quick and easy too. I loved my box too Cathy. No thinking and everything ready to hand – win win! Courgettes – would make stuffed herby courgettes from my new recipe book! I would like to see kohlrabi, make soup or stirfry with it. I would like to see Mushrooms to make a Mushroom Stroganoff. I’d like cauliflower. Not very original I know but I love cauliflower cheese all bubbling hot from the oven. I invariably sling edamame or peas in there for extra protein and top with tomato slices. Served with a heap of a spinach salad. Yum. Cauliflower cheese is one of favourites. I occasionally add mushrooms and like you top with tomato slices, but never added peas or edamame – nice idea. I would love to see butternut squash, as I love it, but find it hard to prepare. The recipe would have to be either a curry or a risotto. Celeriac, I love it simply roasted in a little extra virgin olive oil with a generous sprinkling of paprika and sea salt. Roasted celeriac or mashed with potato are two of my favourite ways of eating it too Vicky, though I must say the curry was very good. I would like to see loads of ingredient for a tasty stir fry! I would like to have peppers and I would make a pepper, onion & olive oil mix cooked in the oven to accompany virtually any meal. Purple sprouting – I love it boiled and covered in butter! I would love to see broccoli since its my favourite vegetable and I love it in a stir fry! Peppers for a nice hot chilli! I would like to get asparagus – because we don’t usually buy it. I would make a risotto with it. Garlic, to add to my Spaghetti bolognaise to give it a kick. Leeks,together with potatoes and mushroom,double cream and nutmeg to bake a delicious gratin! Butternut Squash and I would make some yummy Butternut Squash soup. I really like beetroot, but sadly, it’s one of the very few foods CT doesn’t like. My friends used to get riverford boxes and they always looked so good. This would be great!!! I would love to have red onions and mushrooms to make a risotto. I’d like to see turnips as I have a turnip gratin recipe I’d like to try out! Turnips with a good recipe would be fab Suzy. I never know what to do with turnips, other than add them to curries. Definitely butternut squash for me, as I’m slightly obsessed with it! I’d love to see a recipe for a curry that uses it. Squash curry is one of my all time favourites and a CT speciality. Though there are even nicer squashes than butternut if you can get them. Ooh can’t wait for the asparagus season to come around Elizabeth. Good idea. I’d like to see sweet potato, it’s so versatile and could be used in lots of different recipes but sweet/spicy sweet potato fries with a homemade dipping sauce would be just awesome! Ooh yes, I’m with you all the way Freya. I’d like to see courgettes and some recipes that’s not just tossed into buttery pasta or in an omelette. It’d give me some ideas for when I get a growing glut of them later in the summer! Oh, I do know that feeling. I long for our first courgette and then suddenly there is nothing but! I’ve got quite a few chocolate courgette cakes on the blog, but with the best will in the world, there’s a limit to how many of those you can make. I’d like to see some different varieties of potato – still hankering after some we used to get from a farm when I was little – they were so good just used to have them boiled with a little butter. Hmmm, not sure you’ll find a fish pie in a vegetarian recipe box, but I guess you can adapt! Celeriac is one of my favourite vegetables, and I’d love to see a soup or stew recipe for it. The curry was delicious Charlene – not something I’d have thought of if it hadn’t been for the recipe box. Definitely leeks and asparagus in a gorgeous roasted vegetable medley. pochini mushooms – so i can make risotto! A curry using jerusalem artichokes – to give me inspiration for how to use all our allotment-grown ones! Haha, I need some inspiration for those too Barbara. My mum used to make a really nice dish of them in a lemon sauce I seem to remember. Sweet Potatoes as they have such a miriad of uses. The Kids absolutely love it mashed. leek in a vegetable soup! Yum! Leeks, potatoes, onions, and other good stuff to go into a nice hearty potato and leek soup. I would love to see sweet potatoes there and would like a curry recipe for it. Celeriac root. I’d like a nice, hearty, winter soup recipe that freezes well. Or any other recipes for using this tasty veg. I would like to see an interesting stir fry or soup recipe with Sugar Snaps. I’d love to see an aubergine and a recipe with a Moroccan twist would be great. I love fennel and comfort food, so would love to see it incorporated into a lasagne! Mushrooms! and lots of goodies for a Veggie Stir Fry! I would like to see asparagus so that I can attempt some asparagus soup. I had it for the first time n a restaurant recently and loved it. I’d like Asparagus, such a great flavour but I never know how to use it. Sweet potatoes and I need some new ways of using them. A recipe for using salsify would be great. I never quite know what to do with it. Aubergine, for a tasty middle eastern aubergine tagine with capers and olives. I’d like to see Butternut Squash to make a fantastic veggie curry! I love courgettes, so would definitely love to see these in the box, although currently out of season. I think some curry recipes would be great. Ohh great question. I would like to see sweet potato and a beef casserole recipe. I would love to make a beef casserole topped with sweet potato mash! Leeks. They could be used in a lovely homemade chicken and leek pie served with lots of seasonal veg. My favourite. I would love there to be some squash and recipes to make some tasty soups for lunches. I’d love to see some asparagus and I’d make a asparagus risotto! I’d like to see aubergine and would love to try some mediterranean dishes. Wild mushrooms to make a mushroom risotto. It’s a shame the shops don’t stock a a larger variety of mushrooms. I’m in total agreement with you there Hassni. I’d like cauliflower and instructions to make one of those cauliflower “rice” dishes that I’ve seen but never tried. I’ve got a recipe for cauliflower rice on the blog Fiona. I would like to see Celeriac, but I’m not sure what to do with it so some recipes would be good! Sweet potato, Roasted sweet potatoes on fried mince beef with herbs and spices. Sweet Potato – I love sweet potato and have it daily…but I’m not very adventurous so would love to find something to do with it. Maybe a pasta dish? I’d love to see sweet potato because I find it so versatile, but it would be good to have fennel which has such a lovely aniseed flavour. I’d like to see carrots, as I love making carrot cakes. I’d like broad beans in the box so I could make a springtime risotto. I would love to see some pumpkin, I have heard it’s good for. A curry recipe would be nice. Fresh vegetables to make a balti as it’s one curry I’ve never made from scratch. I’d like to see flat field mushrooms, as a stuffed mushroom is one of the nicest things ever! Broad beans – I’d love to see them in a gorgeous Spring time risotto dish. I would love to see a butternut squash in the box as it’s one of my faves and a new recipe would be great as I’m always looking for new things to try. I’d love to see kale. I think I would make a spicy spring soup with plenty of ginger, to enjoy with homemade bread. Sounds delicious. Love ginger and kale. Runner beans always a favourite & new local season potatoes! Asparagus would be a real treat, I’d like. Recipe for an asparagus frittata. I would like to see something like mooli, artichokes but never know what to do with them. I only every roast celeriac so more ideas there would be appreciated too. I would like to see Aubergine’s which would be a good base to make ratatouille. Cauliflower yum to make a delicious curry! Aubergine – I’d add it to other root veg and roast it in the oven. We quite like aubergines in our hourpse. Moussaka being a firm favourite for a meal. I’d love to try variations of this dish. Asparagus, I usually put a little oil with salt and pepper and in the oven for 20mins. Though I’d really like some new suggestions maybe for soup or another combination. Cauliflower, I would love to try a recipe I saw for a vegetable curry and the base vegetable used was the good old cauli. some wild mushrooms so I could stuff them, my wife loves mushrooms but hard to find decent sized ones these days! Artichoke! It’s my favourite but I’ve never cooked with it and no idea how to use it so any recipe would be good for me ! a real, proper, well grown tomato – cannot be beaten at all! I’d love Cauliflower as Cauliflower Cheese is my speciality ! I’d like to see some cauliflower recipes – something a bit different. We eat a lot of cauliflower in our house, but we’re not very imaginative so it would nice to get some good ideas! sweet potatoes would be good i like to make them into chips! I’d be happy to see a pumpkin or squash for a soup which is good any time of the year. Carrots and a vegetable soup recipe. Yes, I love sweet potatoes too Victoria, but tend to do the same old things with them, so a fabulous new recipe for those would be great. I would love to see some squash of some description and some new ways of cooking it, I always tend to roast it! Maybe a risotto. Happy to see any vegetables (except turnips and radishes) – especially some of the more unusual ones with some new recipes suitable for vegan cookery – I do tend to use a lot of cauliflower, courgette, mushroom, peppers so would be nice to try something different. Yes, I’m not a great fan of turnips either, though I find I can tolerate them in a mixed vegetable curry. I’d llike to see an artichoke, and any recipe as I’ve no idea how to cook one but want to find out. I would like to see fennel in there and recipes for vegetables baked in the oven as the taste is far superior. Carrots and roasted recipies as I get bored with boiled ones. I’d love to see beetroot in the box. It’s lovely in sandwiches with smoked mackerel and horseradish, borscht (beetroot soup) and last, but by no means least, moist beetroot and chocolate cake! I would love to see leeks and mushrooms in the box, would love to make a creamy leek and mushroom pie! 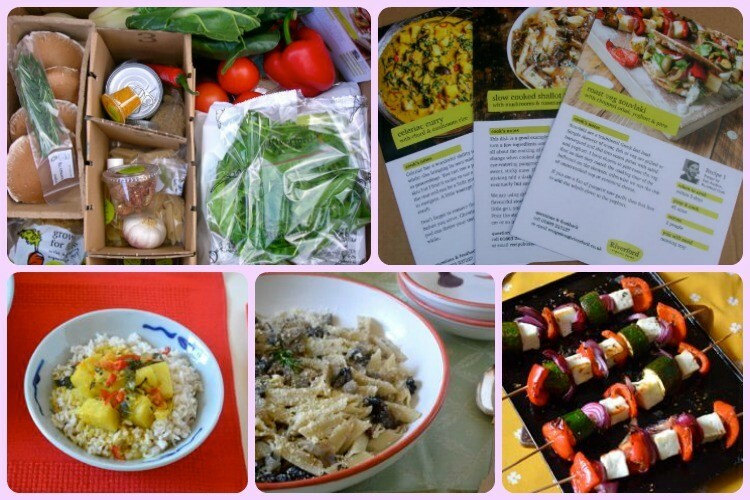 I recently tried the Riverford recipe boxes and was very impressed with how tasty the recipes were. The vegetables are flavoursome and the portions are enough for 4. Yes, our box for two lasted us pretty much the entrée week Tina – really enjoyed the recipes too. Any kind of squash as I never quite know what to do with it so I’d love recipe suggestions. I would love to see a mix of traditional and not so well known vegetables. Parsnips, to make creamy parsnip soup. celeriac – not something I know how to do alot with other than putting it into soups! I would love to see mushroms so I could make a nice risotto. A well flavoured full size carrot – I’d make the Crecy pie recipe from the Cranks cookbook, but use the family pastry recipe. Cavalo Nero – I really want to try it but always end up with the tried and tested favourites. I love tomatoes so any inventive recipes involving those would be great! I’d love some red juicy tomatoes to make my favourite tomato pasta dish! I’d love to see some kale to make some delicious stir fries! Wild mushrooms for a mushroom risotto. I would like to see leeks. Being Welsh, I use them in everything. I would love to receive any type of onions in the box and a recipe for vegetarian lasagne. Something a bit unusual, like Kohl rabi? I am in the process of cutting out processed foods and reducing meat intake whilst increasing good quality fruit and veg intake. My hubby is unsure about the meat reduction and I’m finding it fun to come up with healthy meat free recipes to prove we don’t need meat every day. I’m enjoying the challenge. I don’t know what I would make with Kohl rabi – that’s why I specified that as I would need to research it to see what I could do with it! I love spending time in the kitchen destressing and making healthy meals for my family! Kohl rabi is a good one Dawn. I grew loads of it last year, then as I wasn’t too sure what to do with it I forgot to harvest it. Good luck. 8 ball courgettes – new ideas on what lovely ingredients to stuff them with! Courgette or sweet potato – they’re so versatile. Leeks. I like leek and chicken pie and would love to see a new twist on this classic meal. I would love to see some butternut squash to make a healthy vegetarian curry with basmati rice. I think I’d like organic carrots. We could make a lovely carrot soup. I’d like to see asparagus in any vegetarian recipe. My absolute fav’s are mushrooms and tomato’s so a recipe which combines them both would be fab ! I never use cauliflower anymore as my husbands not a huge fan and as a family we all find is a bit boring so I’d like to see an exiting recipe using cauliflower. I’d like sweet potato and I’d make sweet potato curry and a soup too! I’d like a butternut squash and a butternut squash and sweet potatoe risotto recipie. Spinach for a healthy recipe. Leek and perhaps a pie or a soup? I would love to see spring onions and maybe a thai or chinese style recipe. Peppers are my fave as they are so versatile. But any veggie recipe would be great to entertain my non-meat eating friends! When my shopping arrived this week I’d been sent 4 courgettes as a free gift and, other than chopping and frying them, I’m not altogether sure what to do with them! Receipes showing an alternative use for them would be great. Fancy cutting them into strips – maybe as a pasta alternative? Carrots for me I just love them so versatile can add to most stews, great in soup and makes the most delicious cake!! I really like courgettes and would like to ee it used as a main ingredient. Carrots, with a delicious recipe for carrot cake, I’ve never made it! I would like to see Artichokes – I love them but haven’t made anything with them apart from a dip! Courgettes, I’d make courgette and ricotta lasagne! I’ve just made the fennel salad again that was featured in one of the recipes in my box. It’s become a firm favourite. I would like a selection of spring vegetables to make soup with. I would like Cauliflower and an Indian or japanese style recipe with it – i find them one of the most versatile vegetables. Red peppers with a nice stuffed pepper recipe. I love using aubergines as a chunky substitute for meat. I’ve often thought of trying them in a chilli recipe. Broccoli. Something fresh so that I can cook it in a new way. Love the quality of Riverford. This is a great idea to try new recipes without any waste. I would like to know what to do with some more unusual veg like celeriac and fennel. I just made a lovely fennel salad which was based on one of their recipes. Pak Choi – I know it’s used in oriental cooking but I have no idea what to do with it. Butternut squash and I’d make a roasted and spicy squash soup! I’d like avocado – and I’d be keen to see what recipes you can do with it! I’d like to see cauliflower, as I’ve been dithering about trying to make cauliflower rice. It sounds good so I must try it. Asparagus – it’s nearly time for it, and I could do with some new ideas, a risotto recipe or a really good sauce to enhance it, maybe a soup recipe too. Broccoli. I know it makes me a freak, but I just love it!